Full transcript of the speech. 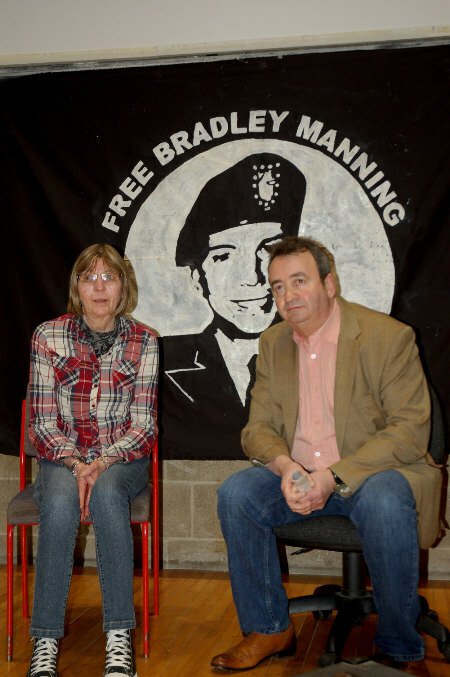 On the 29 November 2013 an event was held in Trinity College Dublin to mark the visit of the family of Chelsea Manning to Dublin. During the evening Gerard Conlon gave a speech that nobody who was there is ever likely to forget. It was Gerard Conlon at his best: fiery, courageous and compassionate. May he rest in peace. [See previous reports by: Ciaron O’Reilly and Genny Bove, a video by Dave Donnellan and a Photo Report]. What Bradley Manning did was to expose the horror of what governments expect children, their sons and daughters, to do on their behalf, the pretext of going to war to liberate people… we all need to be aware of what is being done in our name, because it’s not my name they’re doing it in. I didn’t vote for a politician to take me to war or to take my country to war or to send young men and women to war to be blown up and shot, some of them coming back without limbs, some of them coming back so traumatised that they become outside of society… we have to stand up and.. tell them ‘You represent us, not big business’… We need them to enrich our life, not destroy our lives. We need people to go into the army as a career, not because there’s no jobs. You know, at times like this people are sitting in cells across the world – Shaker Aamer in Guantanamo, Bradley Manning in Kansas – and they can’t hear our voices, but if we talk about it and debate it and encourage others to become part of it, they will hear our voice and not only will they hear our voice but the politicians will hear our voice. It was people power that got the Guildford Four and the Birmingham Six out of jail and it’s been people power that’s got everybody else out of jail. Gerry and his partner Alison drove down from Belfast on Friday 29 November, arriving late afternoon in Dublin. For a couple of hours before the evening meeting, over a cup of tea and later a pub meal, Gerry gave Chelsea’s mum, aunts and uncle his undivided attention and the benefit of his experience. He was full of anger and humanity, talked of the ordeal of his mother and the rest of his family while he was imprisoned and made suggestions for how Chelsea’s case could be kept in the public eye and pressure put on politicians to take it seriously and act. 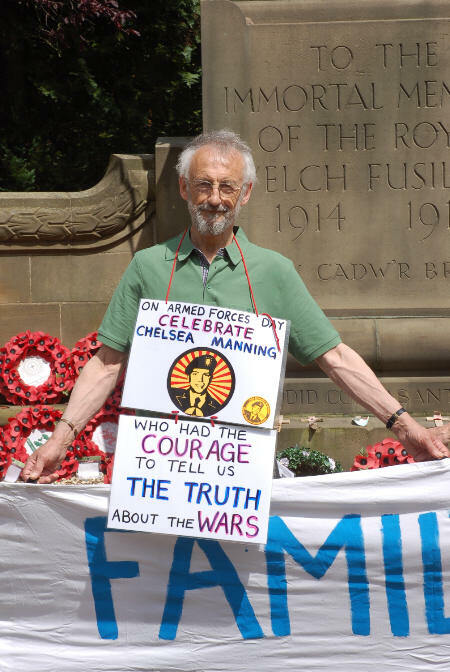 I feel privileged to have met Gerry, to have witnessed his support for Chelsea and her family that day and heard him speak. This was solidarity in action. R.I.P. 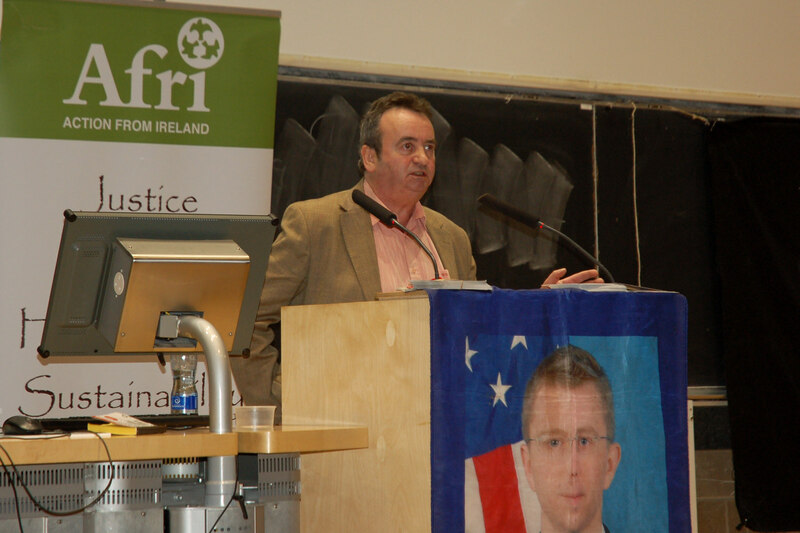 Gerry Conlon, a man who channeled his experience of suffering & oppression into solidarity with others. You can read Harry Browne’s tribute to Gerry, in which he talks about Gerry’s solidarity visit to Dublin, in Counterpunch. See also Gareth Peirce’s obituary for Gerry in The Guardian. Photo: Gerry with Chelsea’s mum Susan at Trinity College, Dublin. Gallery | This entry was posted in Reports and tagged Afri, Bradley Manning, Chelsea Manning, Dublin, family, Gareth Peirce, Gerard Conlon, Gerry Conlon, Ireland, solidarity, Wales. Bookmark the permalink. My sympathy goes out to Alison his partner (whom I did not meet on the night unfortunately) and to all who loved and still love Gerry. May his strong and generous spirit long survive. I only just found out that Carole Richardson died. That’s just horrible, after all she’d gone through, and of course horrible for Gerry as well.